Here's the inspiration photo for the current Double D challenge which is Tea and/or Coffee. My husband is an avid fan of WaWa coffee and one thing he enjoys is a gift card to buy his coffee there. I made a gift tag/card holder for him. Here's the holder, cut from a snippet of dsp to look like a coin envelope, but instead of a flap to close it, I used a large punch to cut a circle at the top to insert the tag/gift card. I used a MFT fishtail banner cut from turquoise, and added a SU! sentiment done with a hexagon punch. Here's the kraft tag that was done with a SU! scalloped top punch and a corner rounder. I used a stamp from SU! Healing Hugs with 2 different colors of brown ink to make the background, then sponged the edges with antique linen distress ink. The coffee cup image has been among my stamped images for years, and I have no clue who made it, but I colored it with Copics, clear heat-embossed it, and then fussy cut it and placed it on the tag. I added some SU! chocolate chip ribbon with neutral twine tied around it. 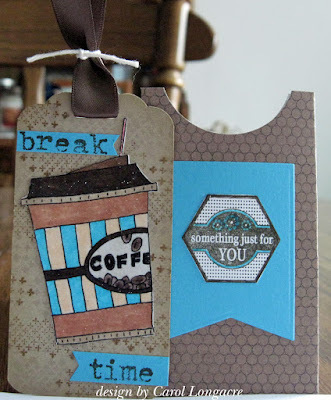 The "Break Time" sentiment was done with stick stamps on turquoise with early espresso ink and cut to fit the tag. The gift card will be tucked inside the pocket along with this tag. I'm sharing this with the Double D Challenge this week which is Tea and/or Coffee. Thanks for stopping by and I hope you enjoy a nice hot cup of coffee or tea today while you visit :) Have a great day! What a cute and clever idea! Very nicely done! Cute and creative idea and great gift for the hubs too! He's going to love it. Love the paper and colors you used. Break Time is the perfect sentiment! Using your stuff... WTG! Super little gift card. This is fabulous Carol, a super way to present a gift card. So well designed and a great way to give a gift card. I love the layout on the tag gift card holder too. OMG what an awesome idea ... great job! 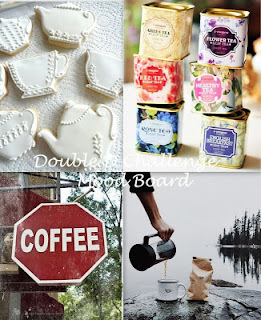 Thanks so much for joining in the fun at our Double D ‘Tea and/or Coffee’ challenge! Good Luck and we hope you’ll come back often. Hi Carol. I love then nifty gift card holder design". This gift card holder is so suited to a coffe GC and for a masculine one at that"
We are currently in London and will be here till Sunday when we fly home. We have had such a fabulous holiday...12 days cruising the British Isles and the rest of the month visiting with our family over there. I even met up with Sue Tossell and Valerie Anne of the butterfly Challenge...two wonderful ladies"
Great design. Thanks for sharing it with us at Double D Challenge Blog. We hope you join us for future challenges. Fabulous masculine gift card holder and tag, love the colors on the cup, beautiful combination. Thanks for playing with SHOPPING OUR STASH, hope you play again soon. Very clever design and absolutely gorgeous. Thanks for sharing with us at Double "D" Challenge – hope you’ll join us again! Fab tag / gift holder!